The best pizza in the Chicagoland area is right here! We have every Italian dish to hit the spot! Thin crust, deep dish, or pan! Pizza, pasta, ribs, sandwiches, and more! 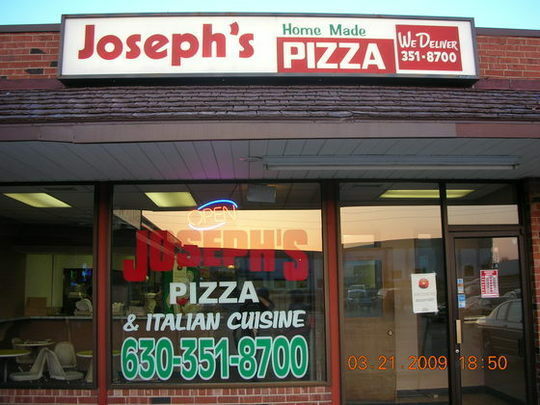 Joseph's Pizza is a small, local restaurant dedicated to serving the northwestern suburbs of Chicago. It has been family owned and operated for over 25 years! We only use the freshest ingredients and put quality first. At Joseph's, we offer thick crust, thin crust, pan and stuffed pizzas. But it doesn't stop there. We have a full array of salads, pastas, burgers, sandwiches, and sides sure to satisfy any appetite. So stop by and try your favorite dish or call in advance for fast delivery!